May lower the risk of antibiotic associated diarrhea, C-Diff associated diarrhea, and other GI symptoms such as bloating, cramping, etc. Gut – Brain Axis Seminar on April 13th – A NYC Chiropractor/Applied Kinesiologist/ NeuroKinetic Therapist will be attending. Previously overlooked, we now know that the 100 trillion gut microbes of healthy people influence their well being in substantial ways. Those trillions of bugs vary from one healthy person to another and from one unhealthy person to another. Meanwhile, as practitioners, we are witnessing an epidemic rise in the incidence of inflammatory conditions associated with the gut-brain axis dysfunction, including anxiety, depression, and early memory loss. Some of it travels along the vagus nerve, and some of it travels in the blood, especially via nutrients, hormones, proteins, peptides, and inflammatory messengers like antibodies and cytokines. The good news is that while abnormal gut microbiota can lead to dysfunction of the brain body and cause brain symptoms like anxiety, depression, brain fog,rising set point, and memory loss, correcting perturbations in gut health is an emerging strategy used as part of a plan to address such symptoms. Currently, the lifetime risk of anxiety is 30 percent, and higher in women, while lifetime risk of depression is approximately 21 to 45 percent for women and 10 to 30 percent for men. Mainstream medicine taught us that anxiety is a response to perceived threat, whereas depression is a response to perceived harm or loss. For decades, anxiety has been treated with benzodiazepines, in an effort to mask symptoms, and depression with a selective serotonin reuptake inhibitor or a new generation of similar pharmaceuticals and occasionally cognitive behavioral therapy. We were also taught that memory loss and other signs of cognitive decline are an inevitable result of aging. Turns out that a more accurate characterization is that these conditions are manifestations of a gut/brain axis that is out of homeostasis.There are five key ways that dysbiotic gut flora can promote anxiety, depression, and cognitive decline: by making your gut wall leaky, by manipulating your stress response (and therefore your hypothalamic-pituitary-adrenal/thyroid/gonadal axes), by disrupting your immune response, by causing chronic inflammation in the body and brain (neuroinflammtion), and by producing harmful peptides and other chemical messengers. In this interactive presentation, I will learn personalized lifestyle medicine strategies for improving intestinal wall integrity—specifically with the use of targeted dietary and lifestyle interventions—including nutrigenomic approaches, “behaviorceuticals” (physical activities that improve mental health), and targeted prebiotics and probiotics. • Review the normal and abnormal function of the gut-brain axis and how it impacts the hypothalamic-pituitary-adrenal/thyroid/gonadal (HPATG) axes and default mode network. • Identify the role of intestinal permeability and the gut microbiome in stress, mood, an overactive HPATG, and central nervous system disorders. • Review personalized lifestyle medicine strategies for improving intestinal wall integrity with the use of targeted dietary and lifestyle interventions, including nutrigenomic approaches, “behaviorceuticals,” and targeted prebiotics and probiotics. precision, and Functional Medicine. She has written three New York Times bestselling books: The Hormone Cure, The Hormone Reset Diet, and her latest, Younger: A Breakthrough Program to Reset Your Genes, Reverse Aging, and Turn Back the Clock 10 Years. For ages, doctors of chiropractor have talked about how spinal joint dysfunction or subluxations affect the not only the motor and sensory nerve flow (and blood flow) to muscles but also to glands, viscera, skin, etc. A spinal nerve is a mixed nerve, which carries motor, sensory, and autonomic signals between the spinal cord and the body. In the human body there are 31 pairs of spinal nerves from the cervical (the neck) to the coccyx (tailbone). 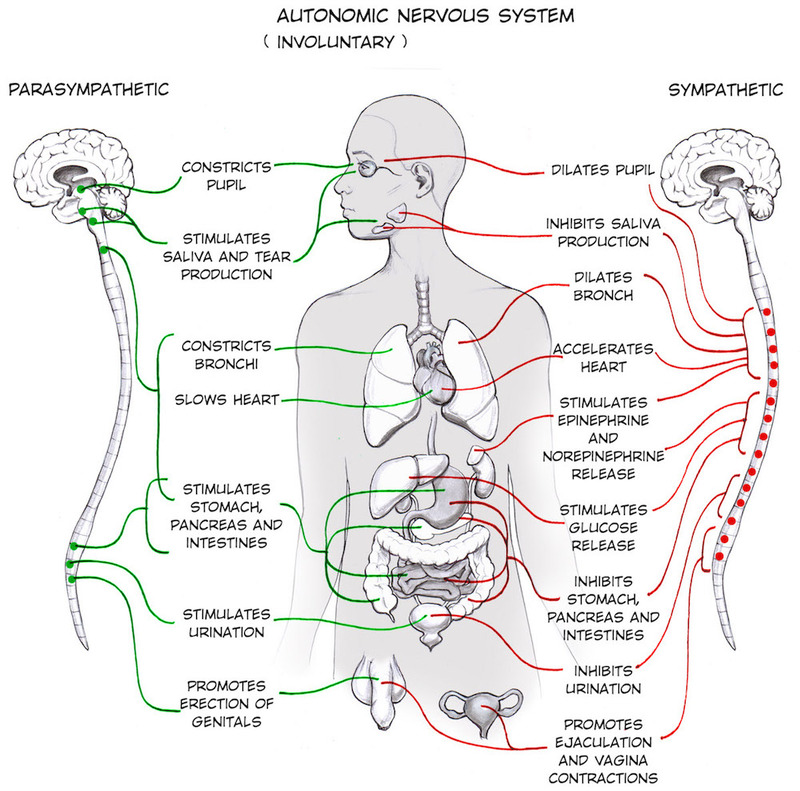 Autonomic nervous system is the part of the nervous system in organisms with spines that controls and regulates the internal organs without any conscious recognition or effort by that organism. The autonomic nervous system comprises two antagonistic sets of nerves, the sympathetic and parasympathetic nervous systems. The sympathetic nervous system can accelerate heart rate, widen bronchial passages, decrease motility of the large intestine, constrict blood vessels, increase peristalsis in the esophagus, cause pupillary dilation, piloerection (goose bumps) and perspiration (sweating), and raise blood pressure. These changes are part of the body’s fight-or-flight response. The parasympathetic nervous system has almost the exact opposite effect; the parasympathetic system is responsible for stimulation of “rest-and-digest” or “feed and breed” activities that occur when the body is at rest, especially after eating, including sexual arousal, salivation, lacrimation (tears), urination,digestion and defecation. The parasympathetic nervous includes some of the cranial nerves that originate in parts of the brain and specifically the oculomotor nerve, the facial nerve, the glossopharyngeal nerve and vagus nerve and three spinal nerves in the sacrum (S2 – 4). So how are the spinal nerve and problems in nerve flow caused by spinal joint dysfunction connected? It’s via the nerves called ramus communicans (plural rami communicantes) – a nerve which connects two other nerves. 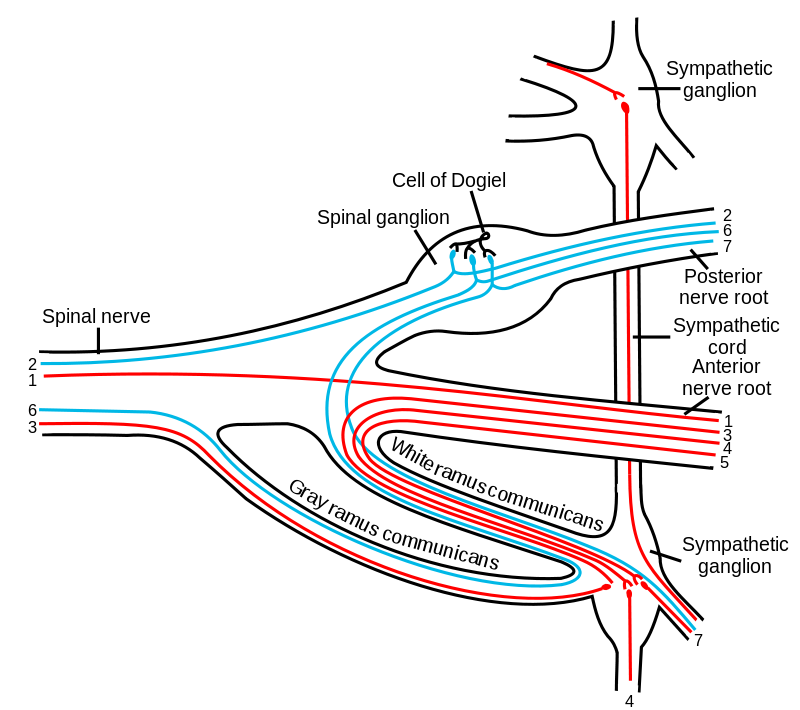 It’s a communicating branch between a spinal nerve and the sympathetic trunk. More specifically, it usually refers to one of the following : the grey ramus communicans and the white ramus communicans. The grey and white rami communicantes are responsible for conveying autonomic signals, specifically for the sympathetic nervous system. The difference in coloration is caused by differences in myelination of the nerve fibres contained within, i.e. there are more myelinated than unmyelinated fibres in the white rami communicantes while the converse is true for the grey rami communicantes. The white rami communicantes exist only at the levels of the spinal cord where the intermediolateral cell column is present (T1-L2) and are responsible for carrying preganglionic nerves fibers from the spinal cord to the paravertebral ganglia. Both ramus within the spinal nerve cross each other, being the white farther away from the intervertebral foramen when exiting the spinal nerve to enter the ganglia. Spinal joint dysfunction or subluxation affects the outflow of neuronal and blood flow to these ganglia. Correction of the spinal joint dysfunction normalizes the outflow of nerve and blood flow and allows the autonomic system to seek homeostasis (dynamic state of equilibrium) resulting in better function and health. Fibromyalgia is a disorder characterized by widespread musculoskeletal pain and sensitivity to touch along with fatigue, problems with sleep and memory and brain fog, People diagnosed with fibromyalgia also often suffer from anxiety, chronic fatigue, depression, irritable bowel syndrome, migraine and tension headaches, painful bladder disorder and TMJ (jaw pain). However other blood tests can be taken to rule out conditions like auto -immune, thyroid dysfunction, anemia, viral or bacterial infection, nutritional deficiencies etc. One of the first things I look at is the patient’s diet/lifestyle: are they eating processed foods, soda,etc. ;drinking enough water; have a history of medications or antibiotics; are they taking the wrong supplements (too little- too much); do they have food allergies or intolerance? I would suspect a leaky gut syndrome and the need to change the person’s diet, test them for allergies/intolerance (igE/IgG) and ileo-cecal problems and the need for prebiotics and probiotics and other supplements to help repair their gut. As a NKT practitioner, I ask “Is there a dysfunction in the coordination of muscles working in patterns?” I would identify muscle imbalances by using muscle testing to determine what muscles are inhibited and what muscles are compensating (facilitating)for them. Are these factors causing the muscles to be sensitive to touch? Is there a problem with the vascular or lymphatic drainage of that muscle? I might use neuro-lymphatic , neuro-vascular points and acu-points to increase lymphatic, blood and chi energy to organs and muscles. How a NYC Applied Kinesiologist Uses Neurovascular Pts for Better Physical and Emotional Wellbeing. Using AK techniques, the flow of energy in the meridians to the organs and muscles can be evaluated and corrected if out of balance. Correction can be made by many methods of stimulation, such as electrical, small tape patches with metal balls, or simply by mechanically stimulating certain spots. There is usually an immediate improvement in muscle/organ function after meridian balancing. Is there a problem with the cranial-sacral system? The purpose of the movement of the cranial-sacral system is to aid the circulation of the cerebrospinal fluid throughout the central nervous system. 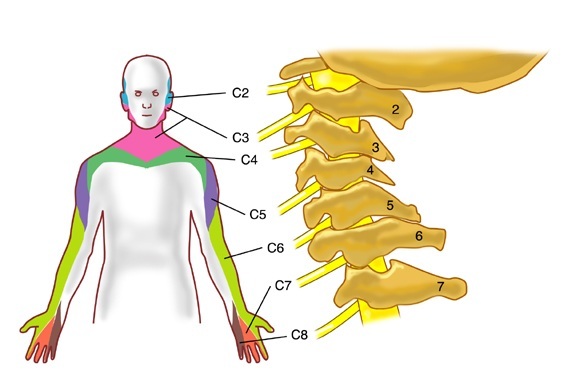 Some have suggested that CSF flow along the cranial nerves and spinal nerve roots allow it into the lymphatic channels. Restoring normal cranial-sacral rhythm enables the body to function optimally and may alleviate a wide variety of painful and dysfunctional conditions within the body. Is the patients under chronic stress? Can I help this patient w/ stimulation of their adrenals or with certain supplements? Is the patient using their diaphragm correctly to order to get enough oxygen to their body? Stimulation of the diaphragm via spinal adustment and neuro-vasular/neuro-lymphatic/acu-points are done. Patient is taught how to use their diaphragm to get more oxygen into their system. Can the patient tolerate gentle exercise like chi gong which is is a form of gentle exercise composed of movements that are repeated a number of times, often stretching the body, increasing fluid movement (blood, synovial and lymph) and building awareness of how the body moves through space.? As a chiropractor, I can use non-force adjustments. It provides a gentle force into the spine of the patient through a very carefully directed and controlled pressure. This method is performed to be able to restore a stronger position and motion to fixated spinal joints taking pressure off the nerves exiting the spinal vertebrae which control the muscles and organs of the body. 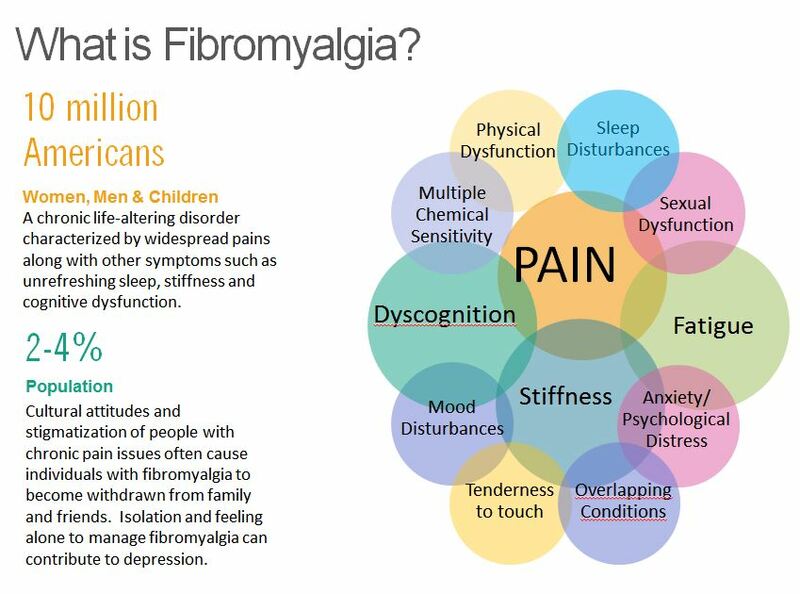 These are some of the questions that need to addressed w/ the the complex problem of fibromyalgia; each patient is different and their needs must be addressed. The hyoid bone is a horseshoe-shaped bone located in the anterior midline of the neck between the chin and the thyroid cartilage . At rest, it lies at the level of the base of the mandible or lower jaw in the front and the third cervical vertebrae(C3) behind. Unlike other bones, the hyoid is not attached to other bones by muscles or ligaments. The hyoid is anchored by muscles from the anterior, posterior and inferior directions, and aids in tongue movement and swallowing. The hyoid bone provides attachment to the muscles of the floor of the mouth and the tongue above, the larynx below, and the epiglottis and pharynx behind. It is located in the front, middle of the throat between the lower jaw and the larynx, which is also called the voice box. The hyoid bone is involved in several functions of the throat, including breathing, swallowing, and talking. Symptoms of a dislocated hyoid bone include: pain, especially when swallowing. difficulty swallowing and talking, swelling of the neck and severe dislocations may cause difficulty breathing. Intubation for a surgical procedure that is not positioned correctly can affect the position of the hyoid. The historical importance of the hyoid traces back to the Neanderthals and Homo sapiens for the origin of speech. Unlike in other mammals, the human hyoid bone works together with the tongue and the larynx to produce effective speech as it is responsible for the movement of many small muscles. 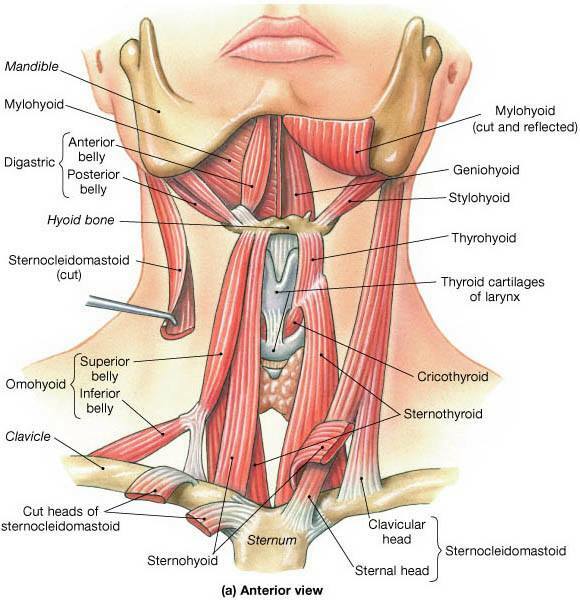 So an imbalance in the position of the hyoid and the muscles attachments to the tongue, larynx and pharynx . One other observation with the hyoid bone is that it can act as one of the body’s gyroscopes; movement of the hyoid bone can affect movement throughout the body and vice versa. Look at the above picture and imagine the change in position of the hyoid and the cervical (neck) spine if, for example, there was a break in the rt. clavicle..destroying muscle control of all the muscles on the right. We know of cases from martial arts that some students have problems with their balance after being kicked in their throats . Look again at the attachment of muscles above the hyoid and how they attach to the bottom of the jaw or mandible ; making the hyoid and its muscles part of an examination of TMJ (jaw) problems. As the TMJ is part of the skull and the the cranial bones are checked for alignment ,and we know that the stylohyoid ligament runs from the temporal lobe of the skull to the lesser cornua of the hyoid bone. I usually enjoy my work but it was great fun !! 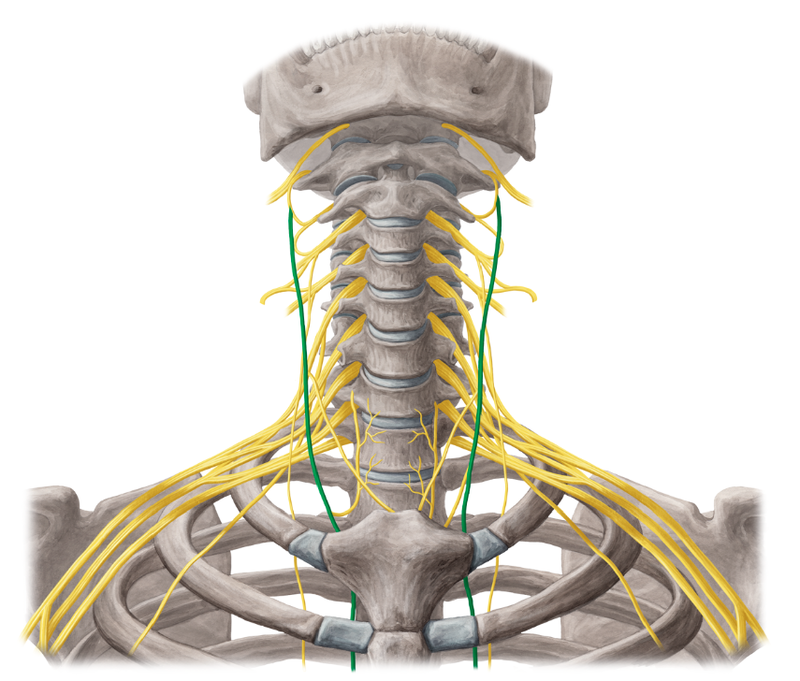 I’ve been pondering the possible connection between the Cervical nerve and the Vagus nerve. 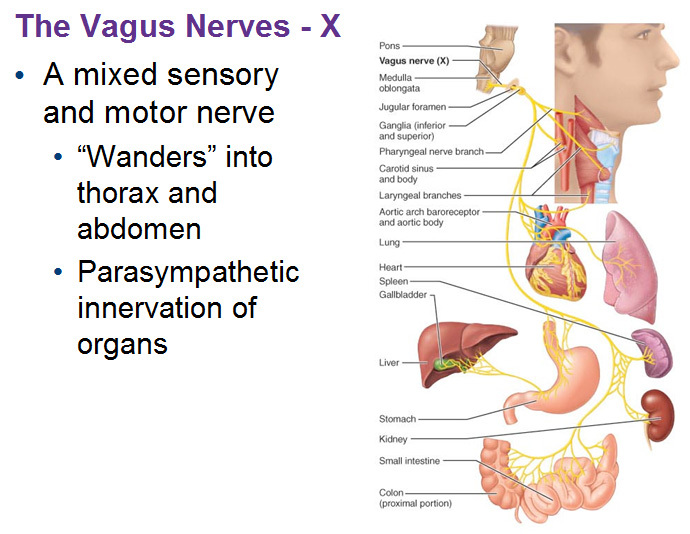 The Vagus nerve is the tenth cranial nerve or CN X, and interfaces with parasympathetic control of the heart, lungs, and digestive tract. 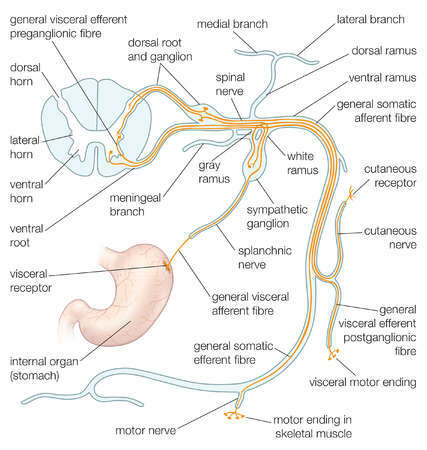 The Vagus nerve supplies motor parasympathetic fibers to all the organs (except the adrenal glands), from the neck down to the second segment of the transverse colon. 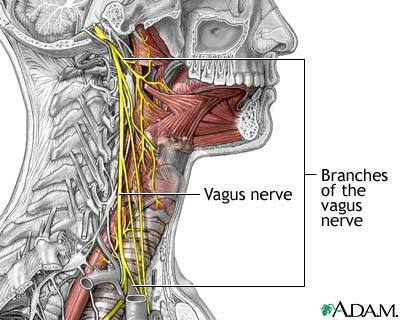 The Vagus also controls a few skeletal muscles in the neck or cervical area. The Vagus nerves are paired; however, they are normally referred to in the singular. It is the longest nerve of the autonomic nervous system. The Vagus Nerve (also known as the “wandering nerve”) exits the upper cervical spine and descends down to the heart and the stomach and the rest of the digestive system. We know of cases where severe massage of the neck muscles affects digestion and respiration. The Vagus nerve travels along the side of the cervical vertebrae; fibers of the cervical nerves and the vagus innervate similar neck muscles. Misalignment of the upper cervical vertebrae affects the nerves that innervate those muscles. A biofeedback can affect the Vagus. A relatively new patient made me ponder this possible connection: he had fallen on his head 30 yrs ago. He complained of neck pain, gall bladder pain, low back pain, walking dis-ease, excessive hunger (drinks lots of veggie and fruit juices). He looked emaciated, held his head forward and his shoulders elevated. His X-rays show facet problems w C1-2 vertebra and a slipping forward of C2 on C3; he admits that he self-adjusts his neck. On examination, found a bilateral weak psoas (a muscle involved in walking) which suggests a fixation of the occipital bone and C1 vertebrae and then also a fixation of C2 and C3. His neck’s range of motion is better and walking is not uncomfortable. Gave instructions on how to track his head back without elevating his chin and told him to stop adjusting his own neck. My dietary advice was to stop juicing and eat solid veggies and more protein. I emailed him a youtube video on how to hold his head and another one on the dangers of self-adjustment. That night and the next 2 days I get emails saying that though he thought I didn’t do a lot; he was not hungry and he had two really good bowel movements and his breathing and his voice is stronger. He was looking forward to his next visit. Forward lean is a constant problem with texting, working at a computer and just bad posture. Note that the doctor in the first video mentions that more forward lean, the more years of forward lean, the more medications the patient is on; more stress on cervical…more stress on Vagus?/…more problems w/ organ function.?! !.